We've seen the Bomb, the Reverse, and the Play-Action. This brings us to the final nail in the coffin for the Fiesta Bowl: Antonio Pittman's 60-yard run off tackle for a touchdown with less than two minutes left in the game. A punch in the stomach that expelled our last breath of hope, it iced the win for the Buckeyes and sent us home empty-handed (yet again) after a bowl game. The thing that really kills you about this touchdown is that despite being outplayed all day by the Bucks, the Irish were still only down by seven, and were in a remarkably good position to get the ball back and maybe get a chance to take it to overtime. 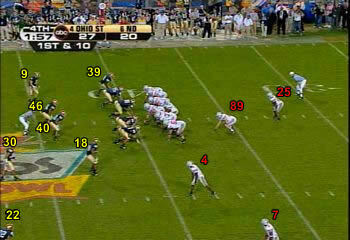 On this series we had bottled up Pittman on first down, then sacked Troy Smith for a three yard loss. So it's third and eleven on the OSU 25, and we get a great pass rush (sans blitz), and Talley has his hands on Smith, and it's gonna be a sack, and they're gonna have to punt -- and we're gonna get the ball back only down by seven with two minutes to go in the game! -- and Smith spins and squirts out of the pocket and somehow finds Anthony Gonzalez down the right line for fifteen yards. And a first down. OSU sets up with 2 backs in an I-formation, White (89) as the FB and Pittman (25) as the TB; and 2 WR, Ginn (7) split wide left and Holmes (4) in the slot left. We've got our base 4-3 package in with all three linebackers. Our two corners are deep and Ndukwe (18) is playing up. Hoyte (39) is showing blitz. Here's a closer pre-snap read with Hoyte creeping up. Talley (99) is the DE on this side. At the snap Hoyte blitzes, as does Ndukwe from the safety position. With so little time left in the game, it's clear we're hellbent on making something happen. We're desperate to get the ball back so we blitz two men. The play goes away from Hoyte, so he's negated. The FB White draws a bead on the blitzing Ndukwe. Talley has crashed inside instead of engaging the LT Datish; was there some kind of defensive line stunt we were hoping to execute here? White ties up Ndukwe. Here you can also see Talley, Landri and Laws all bunched up in the middle, while Datish (50) is free to move to the second level of the defense. Datish picks up Crum while Ginn and Holmes will take out our corners. It's completely wide open on the left side: Ndukwe blitzed, Talley crashed inside, and Crum has been sealed off. Mays is the only guy unblocked and he takes a nice angle, but he's coming from the middle and can't run down Pittman. Holmes engages Richardson, hand-fighting as Richardson tries to shed the block. Pittman outruns Mays while Crum and Richardson are held up. And finally here's Ginn fighting off Wooden, while Holmes gets a last shove in on Richardson. Pittman pops through the hole. Once he's past the corners, it's nothing but daylight for Pittman. Unlike the other three touchdowns we've looked at, there is absolutely nothing fancy about this play call. Ohio State is playing ball control on offense at this point in the game and is simply trying to run down the clock, and what they call is a staple running play: hand the ball to Pittman and let him run left. Yet we're caught in a first-down blitz, and once again the Buckeyes prove adept at blocking downfield. A simple run that our defense would usually stop cold instead turns into a 60-yard romp, and the game is effectively over. As for our defense, this is a tough play to analyze without knowing the details of how exactly it was drawn up. Was Talley supposed to make an inside move? And if so, was another DL or one of the linebackers supposed to fill the gap on that side? How about Ndukwe: is he supposed to engage the FB if they run right at his blitz, and let someone else fill the gap? Finally, are we sure everyone stuck to his assignment, or did desperation creep in in an effort to force a turnover? There's no question that our backs were up against the wall, and there was still a sliver of a chance to tie (and possibly win) the game. We just needed the ball back, and much like pulling a goalie in hockey, we sold out, bet big on a double blitz and got burned. That happens. Sometimes you roll the dice, and sometimes you roll snake eyes. Tressel's solid. His team came to play, they executed well and blocked really, really well. He identified our weaknesses and picked on 'em, and he pulled out the gadget play just when he needed it. You've got to hand it to the Sweatervest; he's pretty good at rock-paper-scissors. Talent vs Talent. tOSU's creativity was enhanced by some terrific athletes, especially Smith, Holmes and Ginn. (Imagine what Weis would do with Teddy Ginn. Imagine what he'll do when he gets the next Teddy Ginn in an upcoming class. Which he will.) For our part, the Fiesta Bowl exposed some talent deficiencies on defense, none bigger than lack of a solid pass rush. While Talley made a couple of nice plays in the game, we really need a pass rusher opposite Abiamiri who can put consistent pressure on the QB. The blitz is a fickle mistress. Live by it, die by it; you know all the cliches. For all of the chatter about how Minter needs to dial up the blitz more, keep in mind that on three of these four touchdown plays, the blitz was on. Speed in the secondary is only part of the problem. In these four plays there is only one example of a guy truly getting beat in a footrace -- Holmes outrunning Ndukwe on the play-action. We didn't see much of Richardson in these plays; on the Ginn bomb, Wooden never tried running step-for-step with him, so that doesn't tell us much about our backfield wheels. Although he didn't make any tackles, Zibby showed great closing speed, and seemed at least as fast Holmes. Ndukwe is the only player you could point to as being a step slow, and right now he's shedding pounds like a wrestler trying to make his weight for the next match. Hopefully it'll pay off, and he'll be a few steps quicker this year. Read and react. Apart from physical issues, we made some grievous mental mistakes: we blew the coverage on the bomb, we were suckered by the play-action, we didn't identify nor contain on the reverse, we didn't fill the gap on the Pittman run. Weis cited miscommunication on defense as a big problem last year, and it appeared there was plenty of confusion in the bowl game. Unfortunately this goes to coaching and preparation as much as anything else; it's a little disappointing to see this in the twelfth game of the season. Heart of a champion. Still, even with the miscues, there's a huge difference between this game and our other recent bowl performances. After Ohio State went up by two touchdowns just before the half, it would have been easy (and frustratingly familiar) for ND to just collapse and mail it in for the rest of the game. But we kept battling, kept fighting. As in the Michigan State and Southern Cal losses, we never gave up. And despite the big plays given up and the huge discrepancy in yardage, we were still only seven points down with under two minutes left. Sure, this was probably the most convincing defeat of the year, but we can take solace in the fact that we had the opportunity to win despite these huge plays by Ohio State. Finally, it's tempting to take these four plays and view them as representative of the entire season; seeing our problems laid bare like this is definitely depressing. But as we mentioned above, these four plays were also four of the six longest scoring plays of the year out of all the hundreds of plays we defended. Clearly, these are the outliers, the worst of the worst of our defensive breakdowns. The truth is, our defense also made a ton of terrific plays all year, and even some in the Fiesta Bowl. Sustained excellence should be the watchwords for '06, and if we hope to compete at the highest level this year we'll have to be more consistent. Despite the crucible of going through these plays frame-by-frame, and seeing the flaws and mistakes up close, I think we can rest assured that our coaches have an even finer-toothed comb than we do. Improvement is not a guarantee, but you can bet Weis and Minter have diagnosed the issues more thoroughly than we could ever hope to do. Unlike some of our recent admirals, Charlie doesn't seem like a guy content to stay the course while the ship is taking on water. With a little different scheme, and a little quicker pass rush, and a little more recognition, and a little better communication, who knows? We might just get a little better. We had some great help putting this series together. Thanks to Matt for pulling the screenshots; to Nevin for compiling the video clips; thanks to Marc and Paul and Pete for offering their thoughts. And thanks to Keith at BuckeyeCommentary for indulging some questions from us and adding his valuable insight. Time's up...pass your papers to the front.